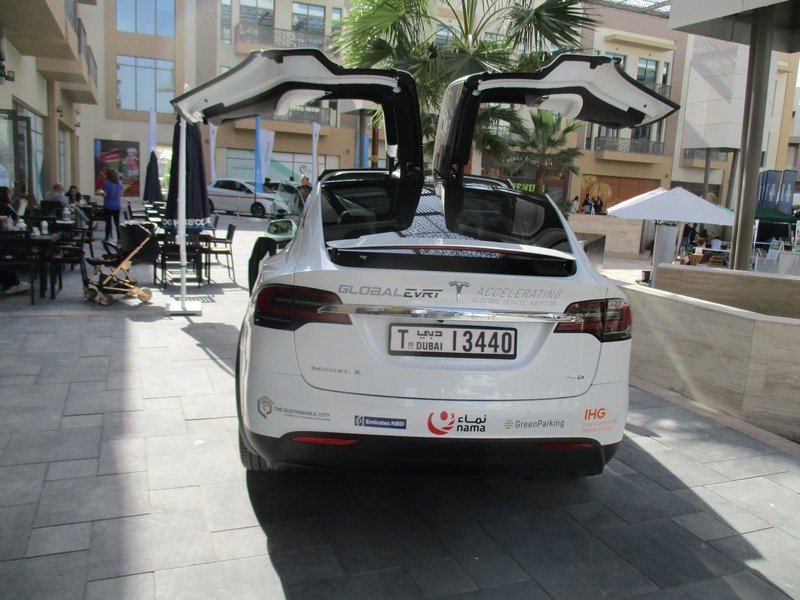 Last year, I had a chance to visit the Sustainable City in Dubai during the Global EV Road Trip. It was my first glimpse of future urban living — the Internet of Things (IoT) at the core, internal combustion engines (ICE) a relic of the past, electric vehicles (EVs) and their chargers ringing the edges of the compound, people-powered inner transportation, social activities built into the life and flow of the community. A recent article in Forbes about the evolution of the smart city has me thinking about urban potential as well as definitive systemic changes that will occur as the US rouses to the reality of climate change. The UN issued warnings late last year about the urgent need for action within the next 12 years to reduce global warming to the 1.5 C. degree mark. With that shift to renewables comes a necessary conscious awakening for each of us as to what’s known as our carbon footprint — those often not-so-deliberate decisions we make on a daily basis that exacerbate or reduce global temperature rise. Part of our future problem-solving will need to consider combined sustainable housing and transportation, and a smart city makes sense in the efforts to reduce anthropogenic climate change. But are we really ready to live in a smart city? Sheridan Tatsuno, an urban planner, reminds us in a recent Forbes article that the genesis of the current smart city movement took place in the 1980s. It eliminated small businesses and poor residents to make way for corporate offices, stadiums, and convention centers, but it also left “ghost cities” behind. He argues that the race to attract “the creative class” resulted in skyrocketing housing prices, gentrification, income inequalities, and homelessness. We must be wary of what we seek, he advises, asking ourselves if smart cities are, indeed, the safer, healthier, and wealthier places they are purported to be. What parameters are we willing to accept in order to make our sustainable dreams a reality? Smart City Surveillance Cameras & AI — Security, but at What Cost? We often think of the smart city as a space that offers carbon footprint reduction through enhanced transportation options like walking, biking, shared rides, and EVs. Yet they are really much more. Citizens who live in close proximity in smart cities need to be assured of low crime rates, secured public spaces, ease of movement, and overall safety from personal threats. Enter CCTV cameras installed onto the sides of buildings. It is a cycle in motion, with the systems collecting more data as the software gets better, which, in turn, helps the software get even better. Every object detected and classified. Sensors share data, compare patterns, train each other. Intelligent Transportation Systems (ITS) are central to the smart city, where video analytics products control traffic signals, provide automatic number plate recognition, divulge speeding vehicles, offer smart parking guidance, and unveil layers of information systems. Some would say these sensors collect information that helps smart cities to manage assets and resources more efficiently than ever before, assisting law enforcement and city services. Smart metering for parking and traffic tickets. Intelligent street lights. Body-worn cameras and home security systems. Smart meters for more frequent readings and home energy consumption tracking. Live streams via an app. With increasing capacity to manage and reduce traffic, energy use, and carbon emissions, software systems are starting to quantify and monetize climate policies. Predictive analytics and real-time alerts. Resilience planning via AI-driven weather and damage forecasting tools. Smart technologies to predict and manage fire, police, medical, water, sanitation, and other public services during and after disasters. Systems are interjected into core infrastructure without seeking accompanying citizen questioning about their effectiveness or social groups on which they’ll be deployed. Often considered public-private partnerships for citizen protection, software systems gather huge amounts of data in a vertical hierarchy that isn’t open to public scrutiny. The lack of data privacy and transparency is unsettling at best, a breach of individual rights at worst. Will such surveillance be used in US smart cities to monitor political and social behavior for a perceived common good? What happens when governments can track huge numbers of people using such software systems? That last part is quite unnerving. Facial recognition as advanced behavioral analysis. Iris scanners. Instant detection for a particular pre-defined action or activity in front of a camera. What happens when an algorithm identifies and targets a group of individuals? When does a technical capacity become an ethical issue? Some would say that moment of no return is as soon as we assume that the technology can and does make decisions for us. Already cities are taking steps to conserve energy, improve energy efficiency, and adopt clean energy. Currently, a Community Power score focuses instead on the way state policy enables communities to choose their path toward these goals. States win points for democratizing energy production and for dispersing the economic benefits beyond a few utility shareholders to the masses. Strong policies such as net metering, interconnection, or requirements for utilities to buy from distributed energy suppliers complement financing tools to expand access to capital, like property assessed clean energy. State grades also increase for policies enabling collective action, such as stretch building energy codes, community choice energy, and shared solar. Cities have become key drivers of climate change work as the federal government has stepped away from the Paris climate agreement and domestic climate initiatives. A smart city of the future will provide economic growth, sustainability, and quality of life. To be powered by renewables like solar and wind is an essential component of smart city plans, enhancing building efficiency and electric mobility, which can be implemented through a network of stakeholders, gaining power through collectively generated influence. Tatsuno agrees in the Forbes article that smart cities also have the capacity to wield collective consumption toward renewable energy goals. “Joining together means solar, wind, or hydro power can be sought on a competitive basis, moving entire cities to clean energy in a fiscally sound manner,” he states. Smart grids are just the start. Smart cities, he says, are learning to leverage hackathons and challenges to apply exponential technologies while ensuring citizen engagement, transparency, governance, and accountability among city agencies, citizens, businesses and visitors. Their ultimate goal is nurturing “smart citizen scientists” where everyone pitches in to improve city services. Smart cities, with their goals of high-quality schools and jobs, affordable housing, convenient transit, open space, and rich cultural activities, must also reduce energy use and carbon emissions to comply with the stipulations under the Paris Accord. The city of today will become the smart city of tomorrow through investment in physical as well as social infrastructures. With the future-is-now entities like Sidewalk Labs helping us to think how the cities of the future will look, feel, and operate, we’re moving closer to the higher density housing near transit hubs in walkable communities. Public health and safety requires greater security measures as more and more functions of a smart city are automated and connected. Smart cities offer great promise but will require significant public scrutiny so that individual privacy concerns are balanced with collective economic and social power.